Harrison Brown looks the part for July Fourth. 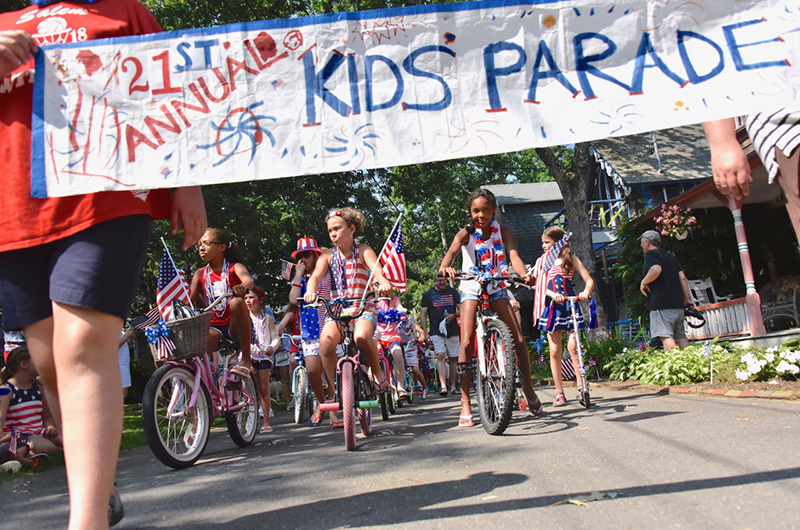 In the cooling shade of the Oak Bluffs Camp Ground, about 150 kids and their families walked, biked or got a ride in a stroller Wednesday morning during the 21st annual Fourth of July children’s parade. There were no floats and marching was minimal as the sea of red, white and blue made its way past the gingerbread houses of West Clinton avenue and circled the Tabernacle. 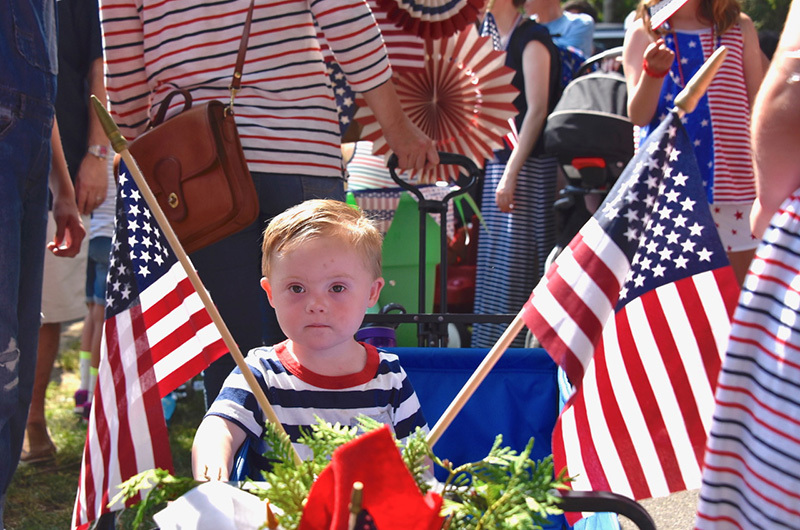 The parade was led by a small band played patriotic classics and kids sang along, parents following closely behind, cell phones out for photos. Jodie and Bob Falkenburg have been grand marshals since the parade began. They said their daughter Pam Rogers and her friend Gretchen Rehak came up with the idea. The first parade included just the two families. The parade is now run by the Martha’s Vineyard Camp Meeting Association. In the other cart, artist Dorothy Burnham was practicing her Queen’s wave to prepare for her first children’s parade as a grand marshal. “I’m still not sure what I’m supposed to do,” she said. “Just wave,” said her driver as they zoomed ahead. After the Pledge of Allegiance led by Lorna Sauter, the parade was on the move along a short route to the Cottage Museum. There were dogs in flag bandannas, bikes adorned with streamers and a painting of George Washington attached to a tandem bike. People walking alongside called it the “unofficial best float” of the parade. 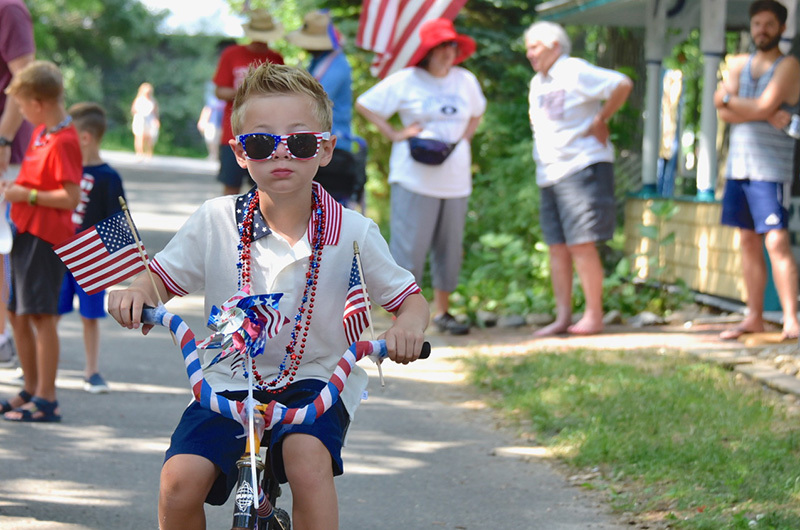 Inside a tub attached to the bike was two-year-old Harrison Brown, who quickly became the star of the parade. His mother Lisa Brown said the float was her idea and she wanted to honor George Washington, her favorite American president. “It’s a good reminder for people of what this country was founded on,” she said. The parade concluded with the National Anthem. People standing on nearby cottage porches joined in, and everyone walked to a tent near the Tabernacle afterward for the traditional ice cream social. Later the Falkenburgs headed back to their cottage in the golf cart, waving to the remaining kids as they drove off. “It was started for the children and it’s still for the children,” Mr. Falkenburg said. More photos from the Oak Bluffs children's parade.